The Weblog, or as we all know it - the blog has proved to be a powerful tool for almost any business that has connections onto World Wide Web. Blogging took a lot of steps before growing up to this point - with over 100 000 000 active blogs. RSBlog! is a powerful Joomla! based blog component that will help you express your ideas easily, within a easy to use interface. As a lineup to rsjoomla.com quality that you are familiar with, RSBlog! incorporates a lot of features in a flexible manner, thus making it a useful tool for both beginners and advanced users. Blogging should be a pleasure not a struggle. This is why it is very important to have all the right tools in one place. Users that are always on the road haven't been forgotten. RSBlog! incorporates a remote publishing feature - basically with a simple email you can have your usual post. Have ideas ? You can suggest new features or improvements on our feedback section. Introducing RSBlog! 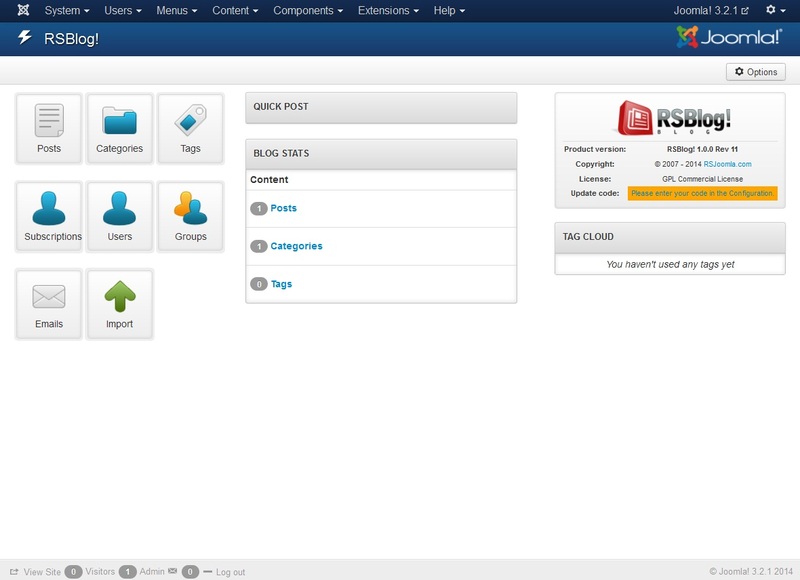 - the most powerful blog component for Joomla! With every purchase of RSBlog! you will receive an equal RSComments! package. We know how important it is for our customers to get in touch with their users and develop a community so that's why we've created this promotion. Get it while it lasts!